Project Description: ABBA Construction, Inc. was a subcontractor on this project. Scope of services included site work, civil work, potable water connections, sanitary sewer connections, architectural, structural, plumbing, fire protection, mechanical and electrical work to construct a 2,300 sf. masonry and bar joist building (Headhouse) and an attached 3,200 sf. 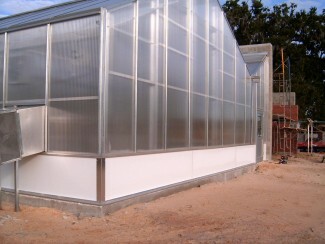 aluminum-framed building (Greenhouse).